I. Vessels manufacturing and repairing services - Revenue rise 15% compared with year 2013. II. Vessels chartering and equipment hire - Revenue drop 80% compared with year 2013.
o Offshore support vessel (OSV). o In FY2014, 12 units of OSV delivered by Coastal and addition to 7 units lower-premium tugboat and barges. o Total value of vessels cost RM 872 million. o Feb 2015, Coastal secured shipbuilding order book to RM 1.5 billion and this is slated for delivery period of two years until 2017.
o Group also successfully secured a RM1.24 billion contract for the fabrication (制造). 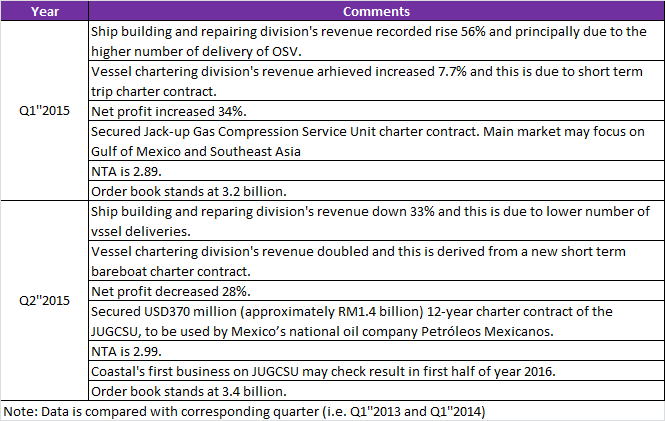 o RM 800 million sales contracts are secured in April 2015.
o 2nd Jackup Rig (JU rig) is going to complete in Q4''2015. o Total order book is amounted to RM 3.6 billion and able to sustain revenue over 2 years. o Business expanded to Mexico and South America. o Q3''2015 mentioned look forward on the oil and gas asset named JUGCSU (Jack-up Gas Compression Service Unit)and Coastal Driller 1.
o Coastal switch its main PPE from Malaysia to China. o British Virgin Island and Singapore are new market entered through investment on new subsidiaries. o Giving up Saudi Arabia' market. o Main customer is Nigeria and then followed by Egypt and British Virgin Islands. o 4 new markets are entered. o Dividend payout maintained around 20% of net profit. o Total PPE increased 172%, all of this contributed by Office equipment and Construction work in progress. o Nigeria's vessel market for Coastal is attractive because Nigeria is the 12th largest producer of petroleum in the world and the 8th largest exporter. 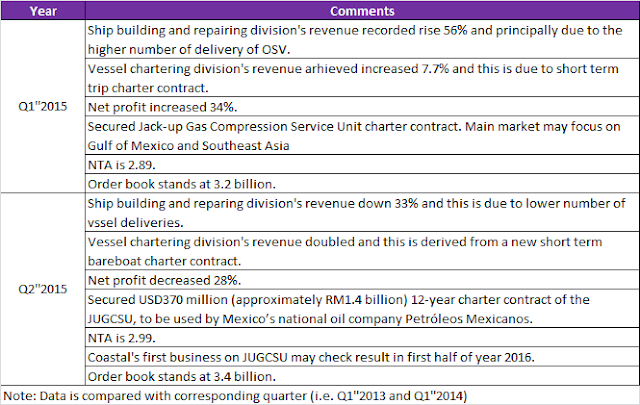 o New business opportunity JUGCSU and Coastal Driller 1 may check in Q3''2015 which announced around 21 Nov 2015.
o From the various intrinsic value models, my target price to Coastal is RM3.70. o Latest net net of Coastal is RM 2.60.
o Since 2014, there are large investment fund pumping to expand its business. o Free cash flow of Coastal consider as healthy as its amount is near the net profit earned. o From year 2011 to 2014, CAGR of cash result approximately 33%. It mean its cash grow up rate per year has average of 33% annually. o With trailing PE, the PE of Coastal is 5.58 and its history DY is touched 3% every year. 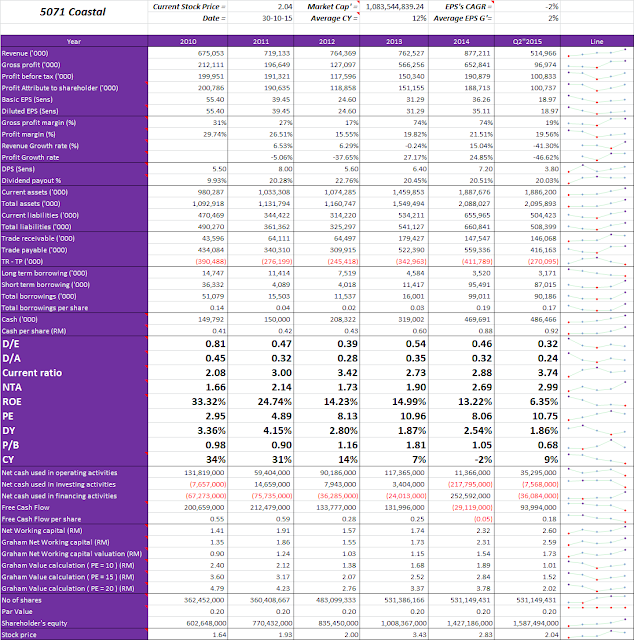 o ROE is decreasing each of the year, this is mainly attributed by the equity's grow rate is faster than the net profit. o EPF is one of the shareholder and holding near 5% of total shareholding. o Trade payable is the main risk of Coastal because deficit trade may result the company unaffordable on the credit sales. o Coastal holding cash value RM 0.92 per share so risk of credit on it is "small case". o Trend of crude oil will reflect on the stock price of Coastal. As the oil price drop sharply for the period July 2014 to Jan 2015, the price of Coastal also fall sharply from RM 5.11 to lowest RM 2.27 during this period.